Samvardhana Motherson Reflectec (SMR Automotive), one of the world’s largest manufacturers of rearview mirrors for passenger cars, relies on DEMAG overhead cranes and chain hoist to keep its production line running. The company develops, produces and distributes exterior mirrors, interior mirrors, blind spot detection systems and a wide range of other automotive components. It has 22% of the global market share in production of exterior mirrors for passenger cars, commercial vehicles and heavy trucks and is one of the leading experts for camera based sensing systems in the automotive industry. To keep the production line operating around the clock, SMR Automotive needed to be able to change dies with minimal, if any, downtime. Approximately 40 dies need to be changed every 24 hours. They also needed a good local support solution. 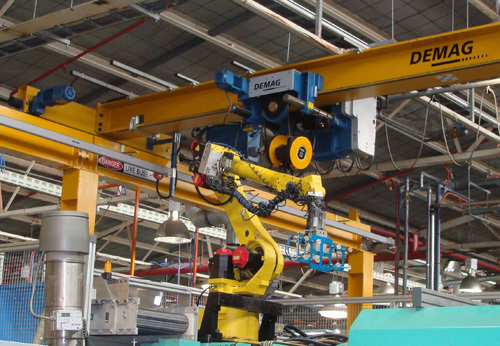 It turned to Demag to provide overhead cranes and chain hoists. SMR Automotive in Adelaide produces close to 1 million individual mirrors per year and according to Ashley Groves, the Plant Engineer, Demag cranes and chain hoists are an important part of the production process, on the production line and in the maintenance workshop. “The Demag overhead cranes are used for changing the dies in the injection moulding machines, so production doesn’t need to be halted every time the dies need to change. The Demag chain hoists, some with radio control, are also used for the changing the die’s in the smaller injection moulding machines,” Groves said. “We also have three overhead cranes in the tool room that are as equally important as the production line as maintenance is essential to maintaining quality parts,” Groves said. Demag’s reliability and excellent local support was a key factor in SMR Automotive selecting Demag as its lifting solutions partner. “Local support is essential, and Demag have good local support, it is no good having a great product if no one can support it, Groves added.